Halloween or Hallowe’en, also known as Allhalloween and All Hallows’ Eve, is an annual holiday celebrated on the night of 31st October. The word Halloween is a contraction of All Hallows’ Evening, which means the evening before All Hallows’ Day. On this day, children dress up as ghosts and go door-to-door, demanding gifts or a treat of sweets or snacks in exchange for praying for the souls of relatives and friends of givers. If someone refuses to fulfill their demand, they threaten him to play a trick on his family members. In a nutshell, Halloween is another big festive event like Christmas, when you can have a blast with your family and friends. When it comes to total sales, Halloween is very close to Christmas. You won’t believe that most candy is sold on this festival. If so, how the web could be left behind for this special occasion! Almost everyone is now planning to add different kinds of Halloween effects to their sites so as to get their loving visitors ready for the “online trick or treat”. Although there are a number of WordPress themes available for this joyous event, but we think it’s a “too much work” for anyone to change their website theme for just one, two or three days. Therefore, we recommend you to use plug-ins to welcome the festive spirit of Halloween to your WordPress site. To help you get your site ready for Halloween festival, we’ve collected 6 free and premium plug-ins that you can use to add different types of Halloween effects to your site. We’re sure you’ll find each plug-in in this list cute and catchy! Let’s watch out them for trick and treat! DW Halloween, written by DesignWall Team, is an easy to install, simple to configure and free to use Halloween plug-in for WordPress. With this fun plug-in, you can deck your site with scary flying pumpkins/bats. Also, you’ll be able to add links or text messages and use them for promotions related to Halloween. DW Halloween comes with a user friendly interface by which you can choose as many pumpkins as you wish and control your animation: pumpkin size, flying path, text, wing speed etc. A few weeks ago, this powerful plug-in got an update with some more creepy characters such as Alien, Bingo, Frank, Devil, Witch, Phantom, Frankenstein etc. Even, now you can upload your own custom flying object like mummy, zombie, goblin or walking skeleton, and can also add fade effect to added items. If you’re looking for a highly customizable Halloween plug-in with lots of options, DW Halloween is the perfect choice for you to give your visitors a feel for Halloween season. You can see this plug-in in action here. 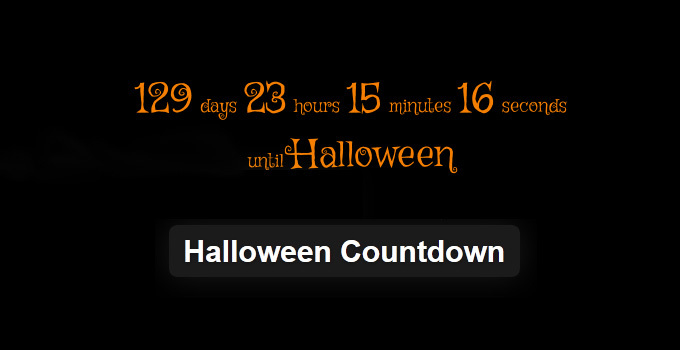 Halloween Countdown is a user-friendly plug-in that helps you add a simple countdown timer to your site, showing the days, hours, minutes and seconds remaining until Halloween day. This plug-in doesn’t store anything in your WordPress database and require you to edit any code or adjust any settings. Just place the shortcode [hcount] to any post, page or text widget and you’re good to go! You can see its live demo here. 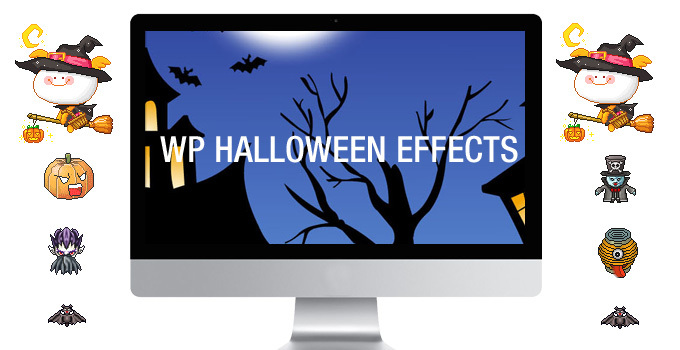 Introduced by WPEka, WP Halloween is a premium WordPress plug-in that allows you to add several different spooky Halloween effects to your site. Using this absolutely attractive plug-in, you can create flying creepy little bats, showcase scary ghosts and display evil looking floating pumpkins on your site’s pages. Best of all, you’ll have the ability to disable all these effects whenever you want without deleting or deactivating the plug-in. To get your hands on WP Halloween, you’ll be required to join WPEka Club starting at $27 per month. 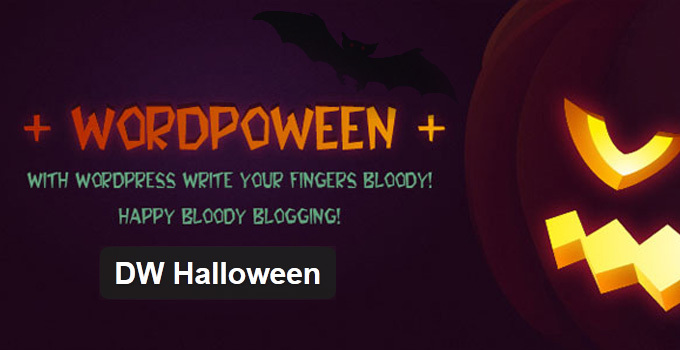 Halloween is another premium WordPress plug-in from Fantastic Plugins. 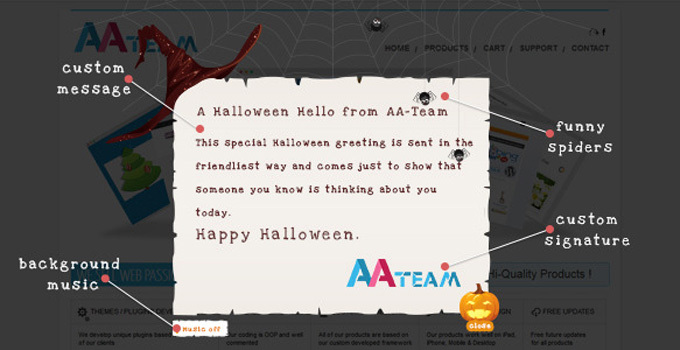 This amazing plug-in enable you add multiple types of Halloween Greeting Card and Halloween Effect to your site. You’re allowed to choose from over 25 different Halloween images. With its intuitive user interface, you can control image fade in/fade out speed, set image position to random or centre, turn on or off image rotation, set image rotation speed and generate custom sized images. Halloween Pop-Up Card plug-in provides you a simple yet effective way to set up a funny/spooky Halloween atmosphere on your WordPress site. This fantastic plug-in lets you create a pop-up card with custom “treat”/message, moving funny spiders, custom background music and custom signature/logo. It comes with a user friendly backend where you can modify the content of your Card. Post published by WordPressintegration Team. Wish you scary Halloween!